18/52 Les Winan The film is missing some of the whimsy of the original, but it's still a well-crafted, creatively shot piece of pop art. Way too much setup in the first half with just enough payoff in the second. 20/159 David Mumpower I have seen comments that it's too slow but I couldn't disagree any more strongly. This is the rarest of rare worthy sequels to an instant classic. 24/65 Kim Hollis Captain Sparrow and friends are just as fun as they were the first time around. 41/47 Amanda Jones Not at all a pleasant moviegoing experience. I feel almost suckered. 58/68 Michael Bentley Has some fun moments, and some pretty good effects, but is ultimately an overlong and aimless mess. Much of it felt like an extended game of Mouse Trap. 60/76 Dan Krovich Dreadfully boring first half, gets mildly better in the second half. 87/200 Max Braden A big (long and dull) disappointment from the first movie. The Pirates of the Caribbean: The Curse of the Black Pearl made $305 million at the North American box office. It added an additional $348 million overseas for a grand total of $653 million worldwide. Then, it went on to sell 11 million DVD/VHS units in its first week, making it the largest live-action flick in history for the medium. Is it any wonder that Disney moved quickly to greenlight not just one, but two sequels? 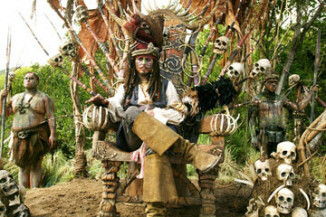 Yes, the second high-seas adventure of Captain Jack Sparrow, Will Turner and Elizabeth Swann will hit theaters in 2006, and according to spokesmen at Disney, will then be followed six months later by a third Pirates film. As the Wachowski brothers did with The Matrix Reloaded and The Matrix Revolutions, both films will be shot at the same time. So far, the rumor has the subtitle of the second film as Treasure of the Lost Abyss. The really great news, though, is that the Rolling Stones' Keith Richards has been confirmed for the role of Captain Jack Sparrow's father. If you're unaware why this is significant, Depp modeled the characteristics of Sparrow after those of the musician. See the latest developments for this project on the Pirates of the Caribbean: Dead Man's Chest Movie News page.